I'm thinking about making it a habit once a year to do an entirely off-topic post and include something on one of my other interests. A year ago, I posted a piece of fiction I had written. This year, I'm going to share some songs, one from each of 12 albums I've enjoyed this year, what I'm calling my best 12 albums of 2012. I might talk about them a bit. I've been a Muse fan since 2001's Origin of Symmetry. I've always loved their exuberant pomposity, and this song really exemplifies that. The idea of making dubstep music with real instruments is inspired and just goes to show you can never quite know what to expect to turn up on a new Muse record. The second eponymous album in my list is by another supergroup. This one includes Mike Portnoy, formerly from Dream Theater and Neal Morse, formerly from Spock's Beard and both of whom are currently in Transatlantic. The album is from this year, but sounds like it was made in the eighties: too-bright drums, screaming guitar solos and grungy vocals. But that all gives the piece a vitality that is sometimes missing from more expansively-produced rock music. Edging sometimes towards the over-commercial, the album is nevertheless complex enough musically to bear repeated listening. After folding the increasingly experimental White Stripes, Jack White revisited his roots somewhat, and returned to the blues-influenced rock of his early work. 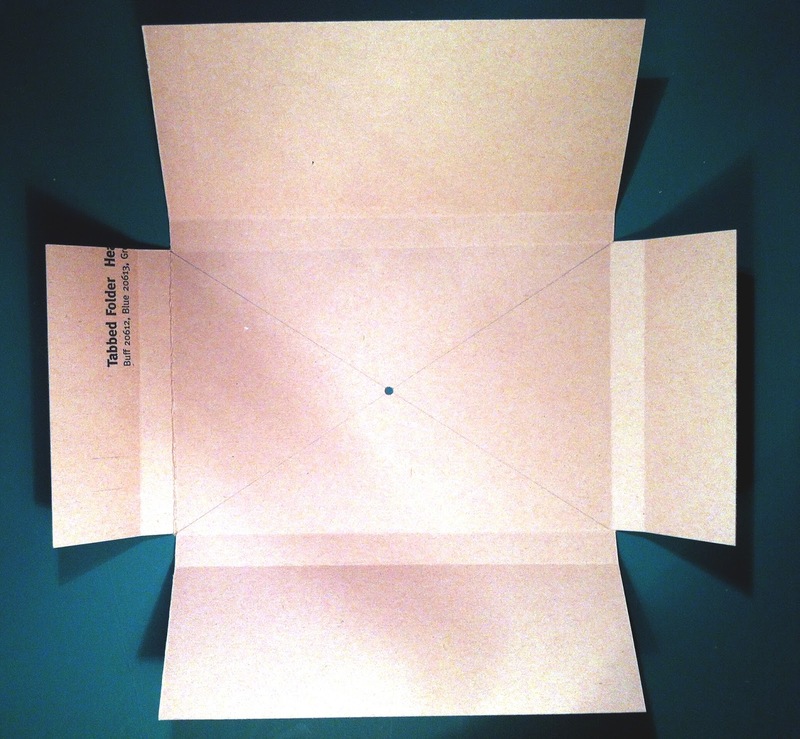 This is a collection of short, urgent, vital songs that is deceptively low-fi. This song best exemplifies the complexity hiding behind the simplicity and you need to hear it through headphones to fully appreciate what Jack White has done here. I ought to apologise for the rather exploitative video, but then I didn't make it. A song about the art forger, Tom Keating, coupling rock and orchestral instruments and including lyrics like, "Thirteen watercolours by Samuel Palmer / Have proven to be his undoing / And so he confesses then he is arrested / Charged him with conspiracy to defraud" really oughtn't to work, but it does, gloriously. The whole album (Part 2 is promised next year) is a celebration of the English pastoral progressive rock tradition. There's a brass band involved in places. And a banjo. Oh, and the last track sounds so much like the Beatles it could have been a bonus track on Sgt Pepper. Staying with the English pastoral theme, Steve Hackett famously used to be in Genesis. He was in the band for their best albums, records like Foxtrot and A Trick of the Tail, where the original version of this song appeared, sung then by Phil Collins (this new version has a female vocalist, Amanda Lehmann.) The album is a timely refreshing of mid-period Genesis, their most creative and interesting period, rendered pretty faithfully but using modern recording technology. I chose this song (which most of the reviewers seemed to consider one of the less successful, for some reason) because perhaps more than any other it delivers a huge emotional payload, a real hallmark of the Genesis of that era. Hackett's collaborators on the massive double-album make an impressive list. Needless to say, The Progfather, Steven Wilson, is prominent among them. It Bites may be best know for their 80s hit, Calling All the Heroes. Since those days, they've been making increasingly progressive records, so it is surprising perhaps that their first concept album only arrived in 2012. But it was worth the wait. Marked by superb musicianship, Map of the Past is a compelling listen, developing musical and lyrical themes that unify the album beautifully. I could really have chosen any song at all, but this one conveniently has a video. Hard rock debut albums don't usually sound this accomplished, but Headspace is a collection of very experienced rock musicians with progressive credentials - and not just because keyboard player Adam Wakeman has a notably proggy parent. The distinctive vocals come from Damian Wilson, collaborator in the band Star One with Arjen Anthony Lucassen (of whom more later...) I had a hard time picking just one song from this album, too. So enamoured had I been of Panic Room's last album, the wonderful Satellite, that I had a hard time at first adjusting to the different character of this album. Satellite had been not a live album but one that had the feel of a live performance, whereas Skin is a more polished, produced affair. It feels more controlled, measured, and it took a while to make the transition with the band. Anne-Marie Helder's at times transcendent vocals sit atop it all and ensure that a certain wildness prevails. It is an album I am still liking more with each listen. From my first listen to their 2008 EP, I've loved this Aussie band, and their new album doesn't disappoint. Driving, psychedelic grooves are accented with the grungiest bass you're ever likely to hear. This video highlights beautifully their sixties influence. It is wonderfully overblown and absolutely infectious. I cannot begin to imagine what quantities of pharmaceuticals were employed in its creation. It's hard to believe that the foremost exponents of Swedish death/doom metal have been at it now for over twenty years. We can only conclude that they are never likely to cheer up to any real extent. Their appeal, of course, is catharsis. Like when we watch Hamlet, we taste the despair and emerge through the other side enriched by the experience, enriched from witnessing noble struggle. Katatonia's triumph is in finding so many inventive ways to play their one note. The distraught angst of this song seems buoyed up by music alternately melancholic and assertive. It seems to cover more ground that its four and a half minutes ought to accommodate. If Steven Wilson is the Progfather, then Arjen Anthony Lucassen heads the exotic, European prog community. A staggeringly prolific musician, this is his first real solo album in many years and it fully obvious from the first that this is a very personal project for him. The voice that opens this song (and which joins all the songs on the album) is Rutger Hauer's and fans will immediately spot the Blade Runner reference in his character's name. The album ranges across the rock and metal spectrum, but this opening track shows Lucassen at his most subversive. Hang on, there: a progressive rock album with an SF theme and spoken narrative interludes doesn't sound very subversive, does it? Perhaps not, but there is subversion here nonetheless. On this track, listen to the ominous guitar phrases that begin to intrude after 1:30 that seem to presage a full-blown metal breakdown. Time and again, though, they give way to acoustic melody, and when the crescendo finally comes, it is not from the from the guitar but from the flute. This is a masterclass in progressive rock. It comes as no surprise when on the bonus disk he boldly gives us cover versions of Pink Floyd (Welcome to the Machine), Blue Oyster Cult (Veteran of the Psychic Wars) and Led Zeppelin (Battle of Evermore) among others and thoroughly pulls it off. Well, there we are: my best 12 albums of 2012. I hope you've enjoyed me rambling on about them and I hope I've convinced you to try something new. That's it for this year. 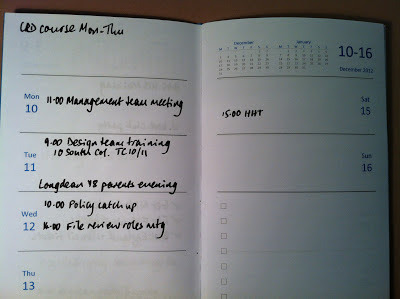 Steve has been using the TM Enhanced A5 layout most of 2012 and has found it a very useful layout. 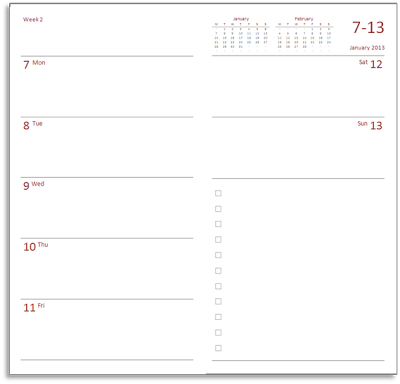 Some weeks, though, he has noticed he's not using the daily tasks space on a regular basis, so he thought that this valuable page space could be used for journal notes. 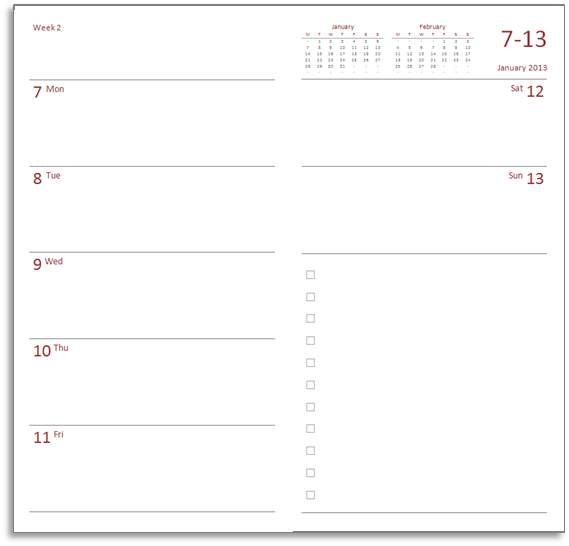 So even if you keep a separate journal, you could at least jot down some notes as a reminder for your journal later in the day. 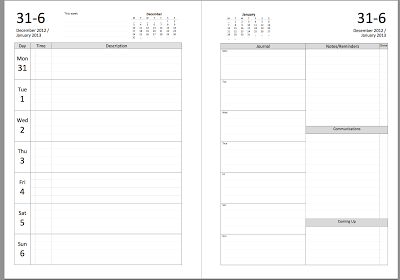 Or if you only keep short notes about each day then this space might be enough on each page. 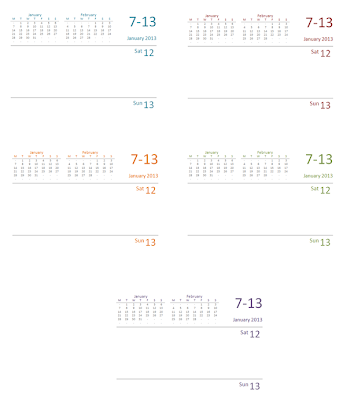 As you can see it's an evolution of the original layout. 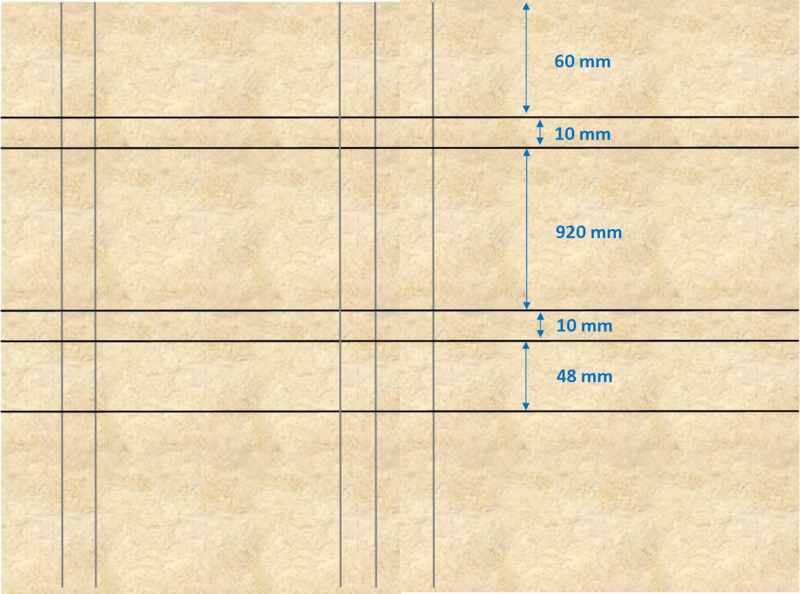 We have made them available in '4 line' and '5 line' format. You can download a 2013 set as either a Word file or a PDF file. 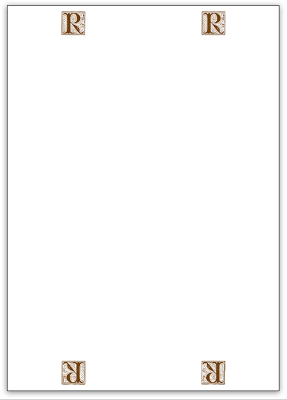 (4 line) or a Word file or a PDF file (5 line). 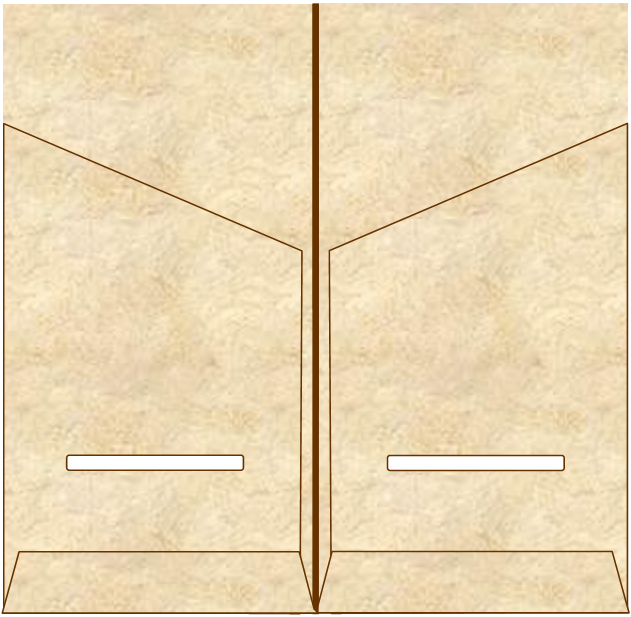 They are created as A4 documents. 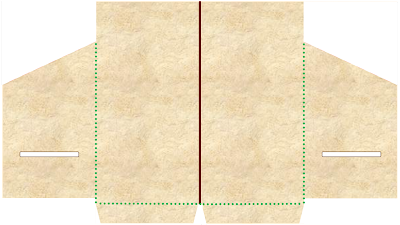 To use them as A5 inserts, print the document in booklet mode on A4 paper, then use a guillotine to divide each sheet into two and punch the required holes, which the templates are set up with mirrored gutters to accommodate. 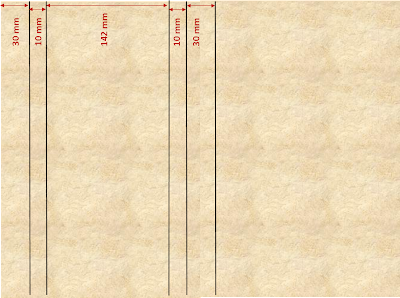 Or, if you have A5 paper, then either the printer or the PC will scale it to size for you. This is going to be a long one, but I think the end result is fantastic and although there are quite a few steps, there's nothing particularly challenging. 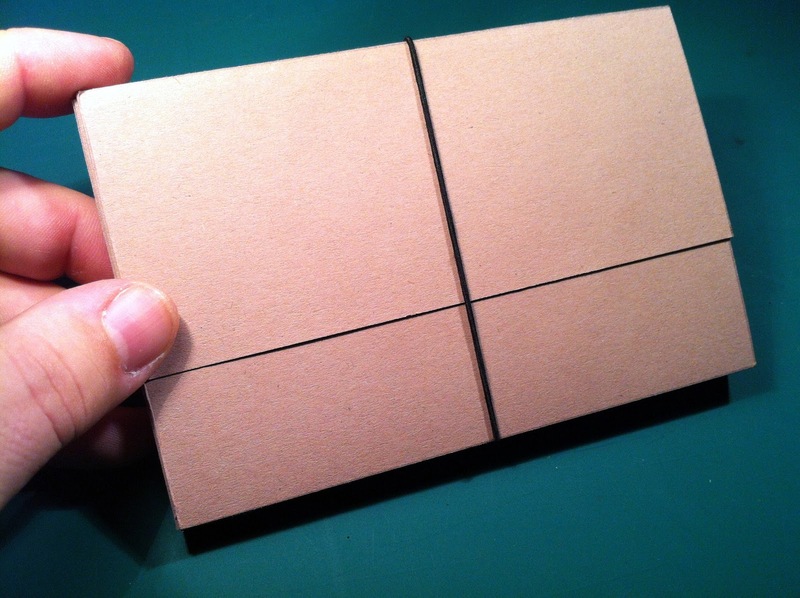 What we're going to make is a cardboard case to hold one thick notebook (say a Moleskine pocket) or several thin ones, like Moleskine Cahiers, Field Notes books, or home-made notebooks of the same popular size, which is 14cm x 9cm. 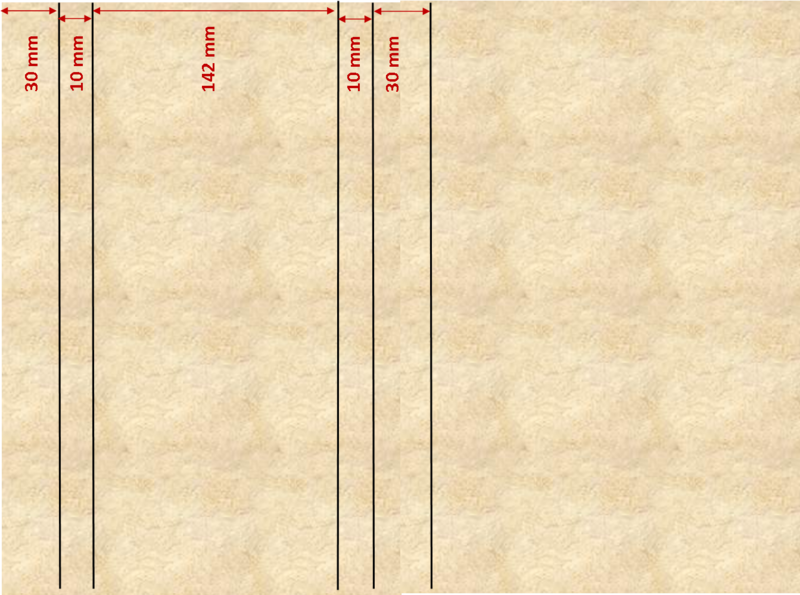 If your favourite notebooks are a different size, you can easily adapt the measurements. 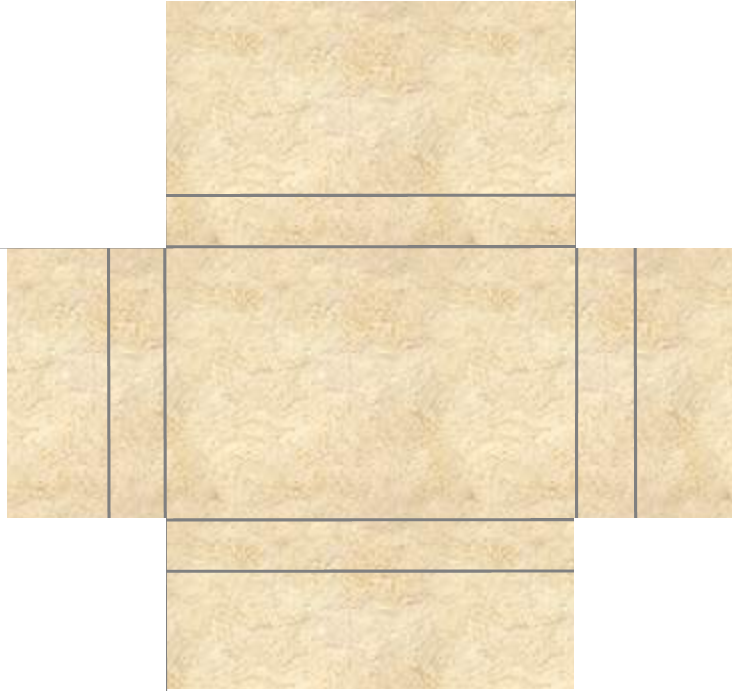 First, find a piece of card that is at least 222mm square. The front or back of a large cereal box would do, or you could use a file folder. You are going to mark some parallel vertical lines in pencil. 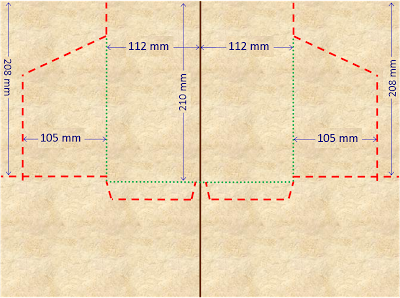 Using the straight left edge as your starting point, draw the lines using the measurements shown. Now draw some horizontal lines. Use the top edge of the folder as your starting point. 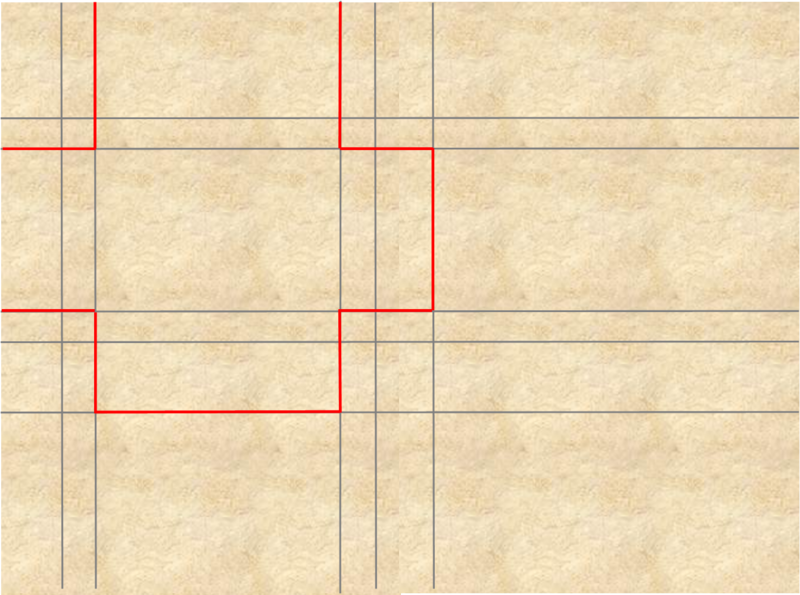 Next you're going to cut out the big cross shape marked below in red. 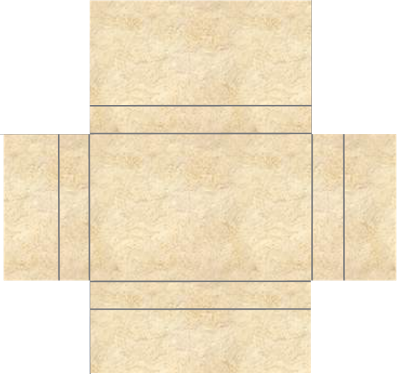 Here's what the piece looks like once you've cut it out fully. 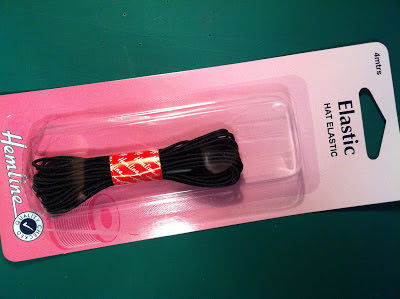 It is called hat elastic because it is used to keep hats in place. If you've ever worn a party hat with elastic that goes under your chin, this is the stuff they used. 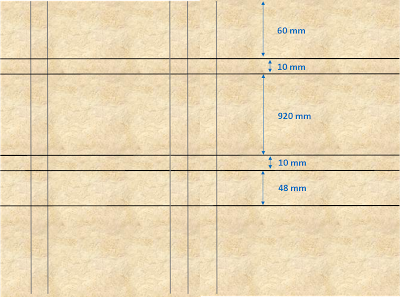 You need to cut a 240mm length of it. 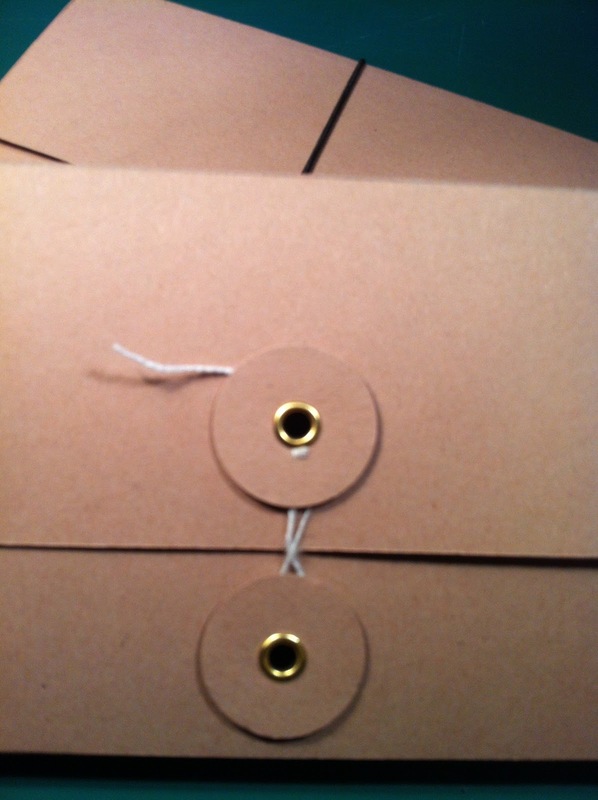 Thread if through the hole from the back and tie the ends in a knot that will sit inside the case. And it's ready. Pop your notebooks inside, fold it up and stretch the elastic round the case. 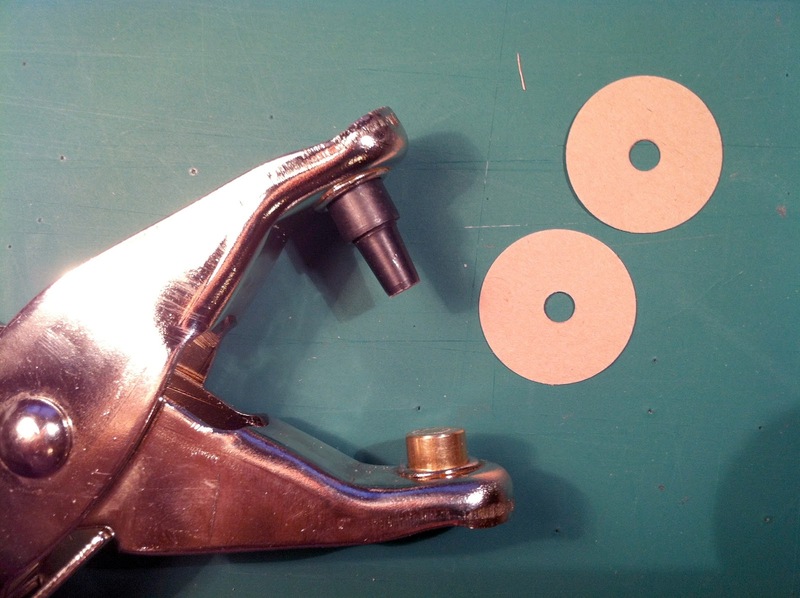 If you prefer a more elaborate fastening and you have the appropriate equipment, you can use some card offcuts to make discs and punch some holes in them. 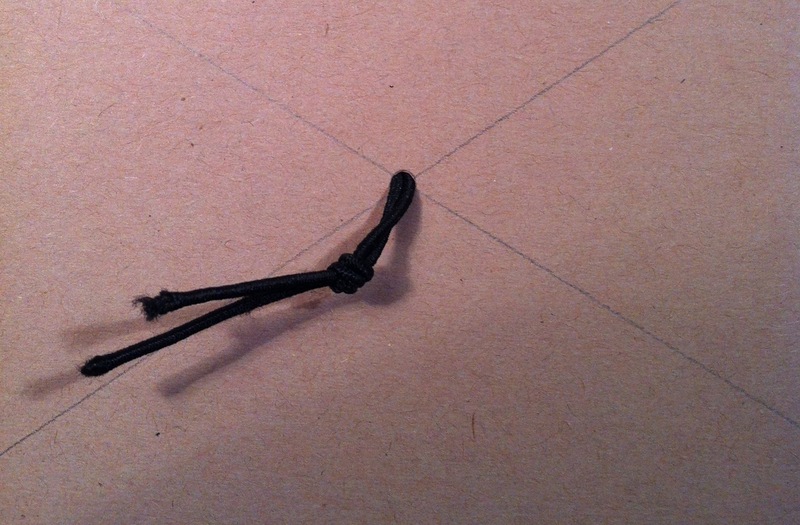 Use brass rivets and some thin string to make a string tie fastening. 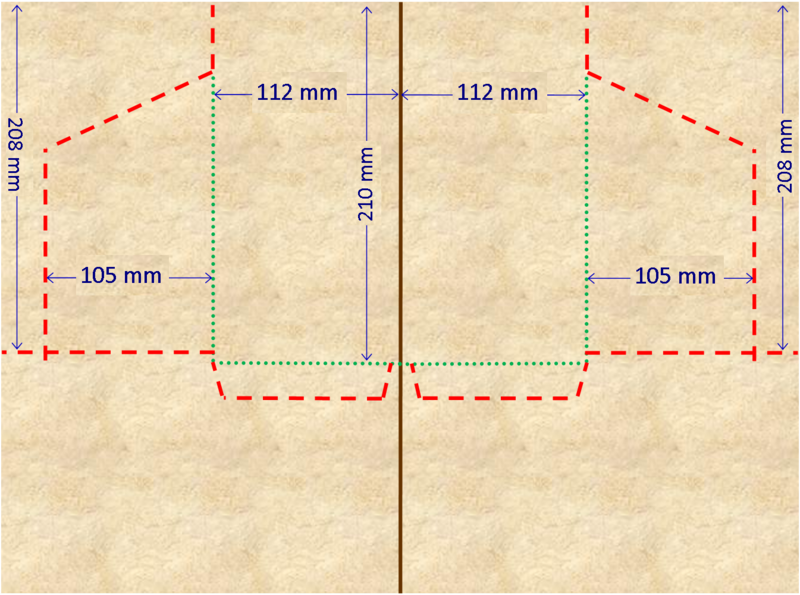 If you want a case that can hold more then simply increase every 10mm measurement in the template accordingly. You can now decorate the case. 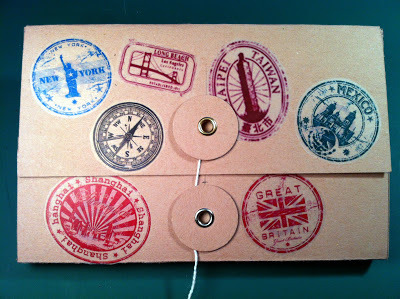 I've always loved the look of manila card covered in travel stamps. 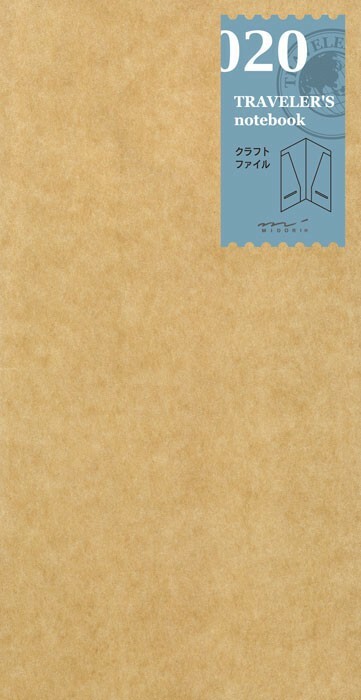 A collection of rubber stamps and different coloured pads is costly, though, so I cheated. Can you tell how? 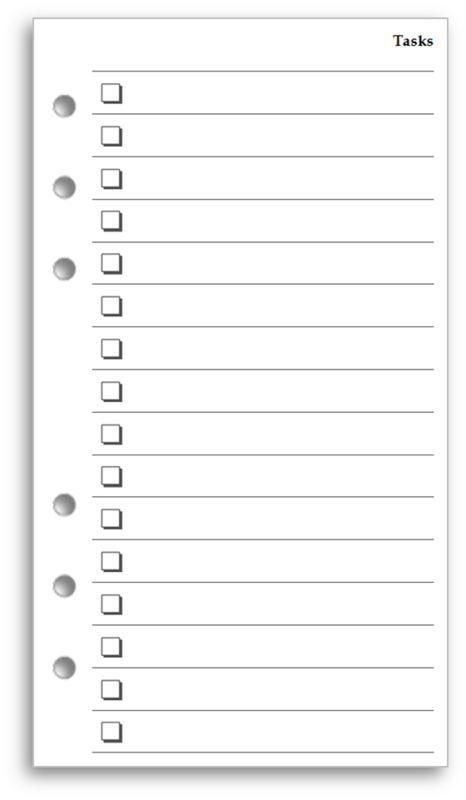 My new and improved task page for the Filofax is now available in Pocket size. Like its big brother, this version boasts 3D checkboxes that are placed to the left. 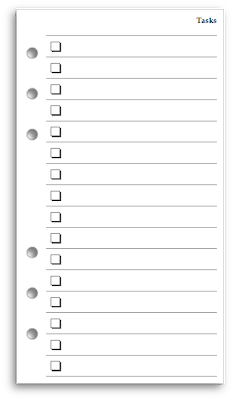 For me it works better than the conventional Filofax to-do page. 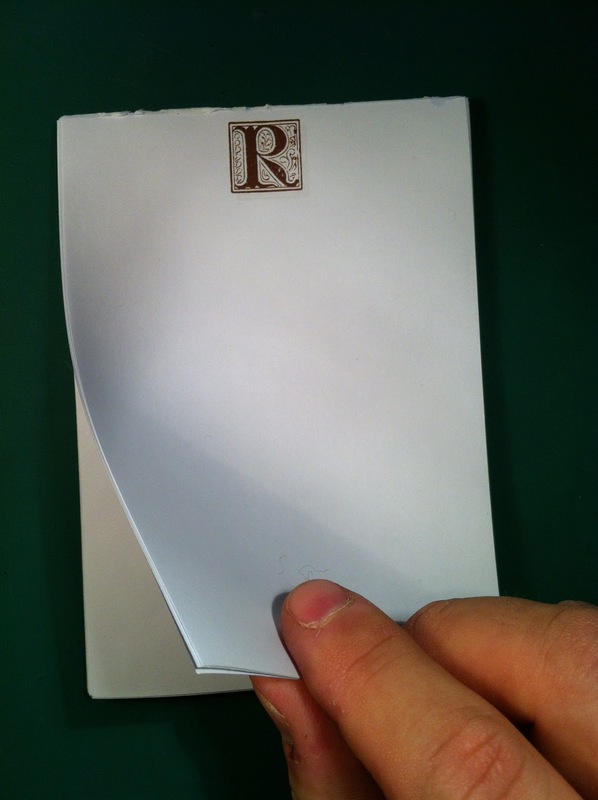 How would you like a notepad of monogrammed paper? Or maybe a 'From the desk of...' pad? It's easier than you might think. Here is one I made today. 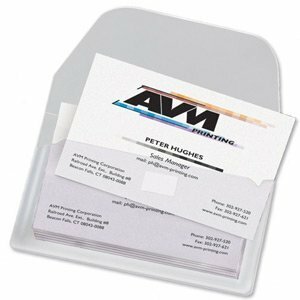 You can use either A4 paper or Letter paper and should place the top designs as close to the edge as your printer will allow. Each should be about a quarter of the way in from the edge, perhaps a millimetre or so less. They should be positioned at the bottom in the same way. 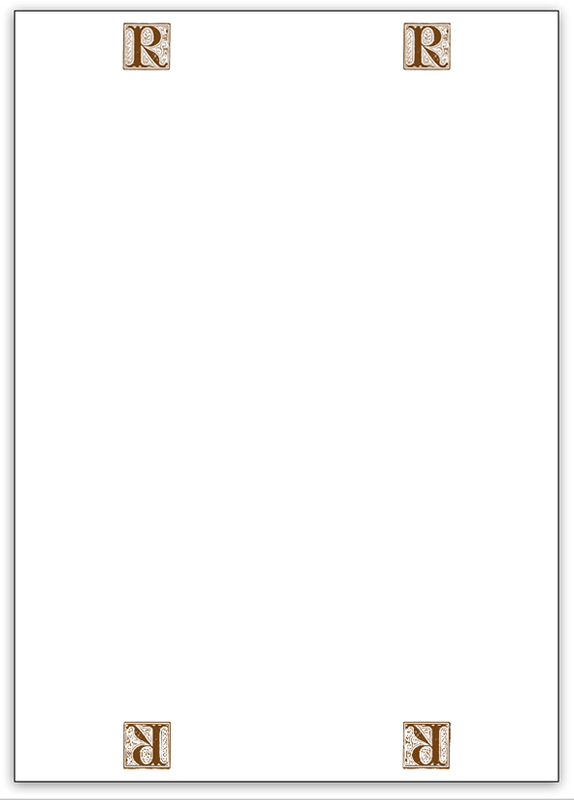 If you want to you can download my MS Publisher template. 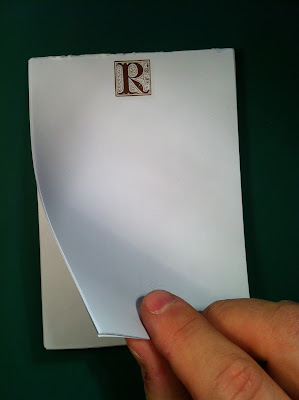 Print ten of these to build a 40-page notepad. Do the same with the other pages until you have 40 mini sheets. 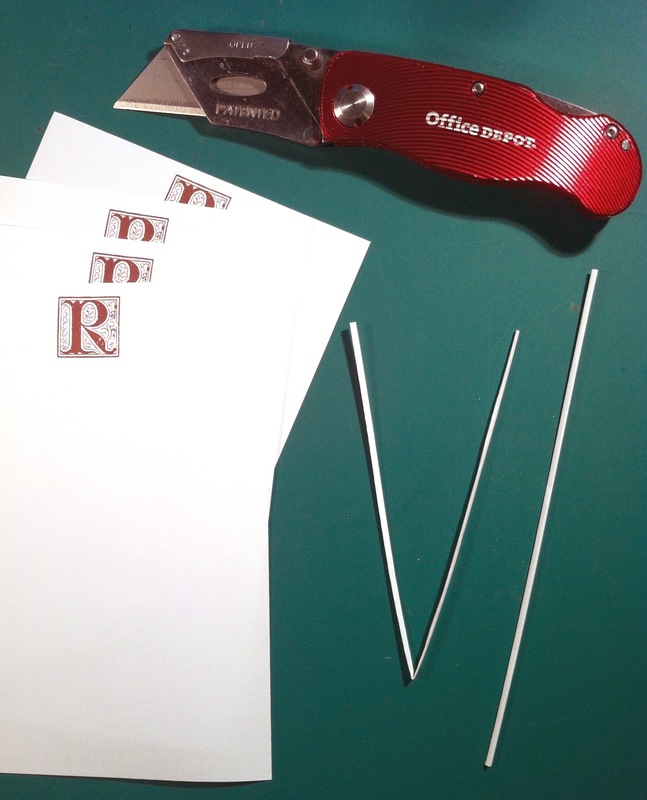 Draw around a sheet onto a piece of stiff card and cut the shape out of the card. Carefully position the pack of pages together with the card piece at the back. I've learned to put one piece of paper behind the card so that later I can remove this once the sealant has dried so none ends up stuck to the back of the pad. You now need to clamp this all together tightly. 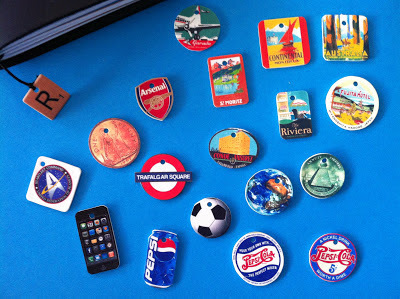 I did it with two cork-backed melamine coasters (one at the front, one at the back, cork sides facing out) and two binder clips. Put the clips on each side so that the whole top edge is free and protrudes just a couple of millimetres above the edge of the coasters. Now stand the pack upright somewhere and give it a couple of hours to dry. Then you can unclip it. Once you've removed the extra piece of paper from behind the card and the top sheet, you should find there's no messy sealant. 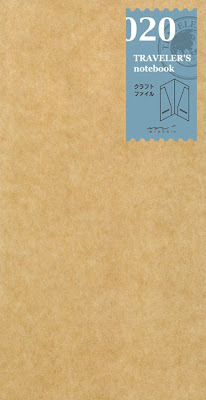 Your notepad is now ready for use. 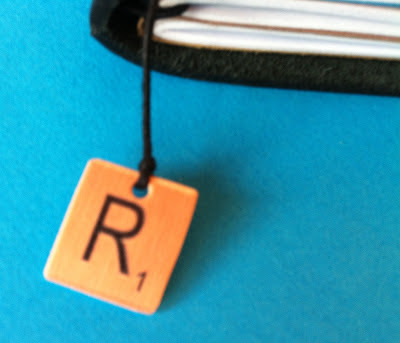 Thirteen commenters were in the running to win a selection of my home made charms. Congratulations, DEM. Please give me a postal address and I'll send you a pack of charms - including your favourite one. When I set up my Midori Traveler's Notebook I realised that I would need to hang a charm from the bookmark if it was to work properly. Unsatisfied with what was available, I made one myself from shrinky dink plastic. 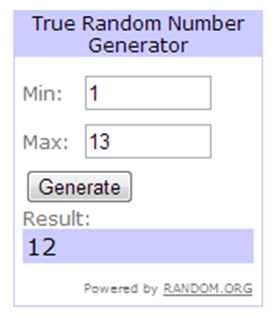 So I have decided to run a giveaway contest for readers of the blog. If you would like to participate, simply comment on this post no later than the end of Sunday 23 December. A random commenter will win a pack of as many charms as I can bear to part with when the time comes. In your comment tell me which is your favourite. If you win, I will make sure the selection I send includes that particular one. Anyone can enter and I will pay postage costs to anywhere in the world. I will announce the winner on the blog and you will then have a week to send me address details, failing which I will select a new winner. 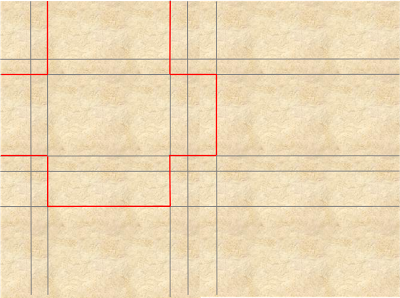 I've developed the layout a little and am today offering it for download. 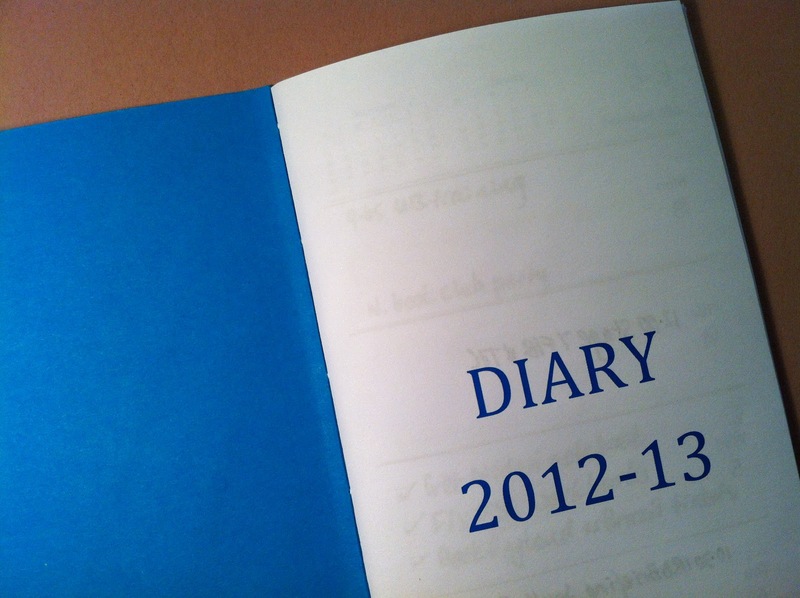 The diary contains the end of 2012 and the first half of 2013. 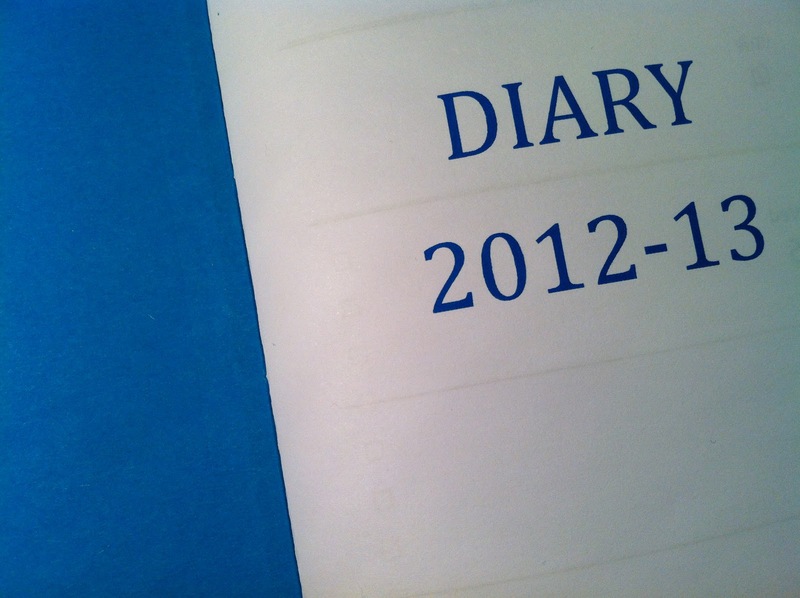 I shall make available further files for the second half of the year in due course. 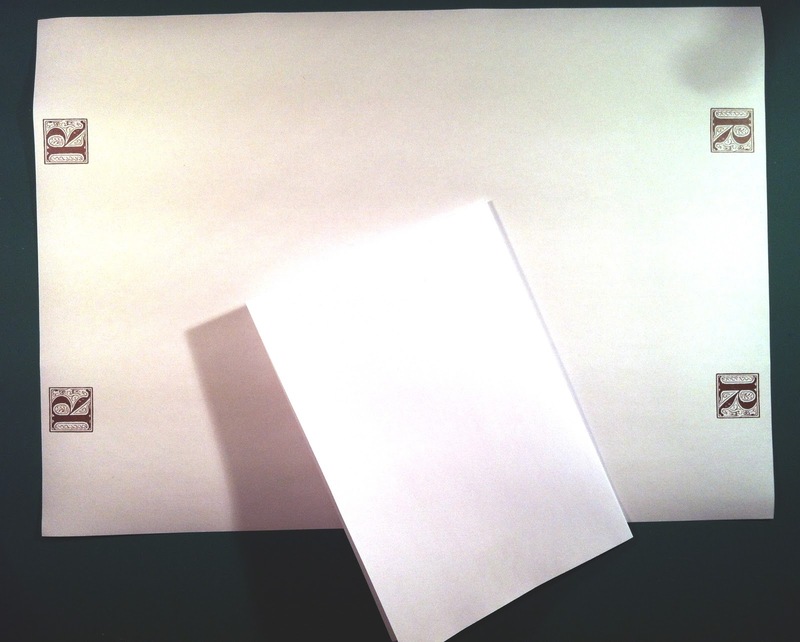 Either way, the file prints double-sided on A4 paper in booklet mode. In all, you'll print sixteen sheets, which you can then bind into a cover and trim. This post will show you how. That central fold will be the spine of our notebook insert. 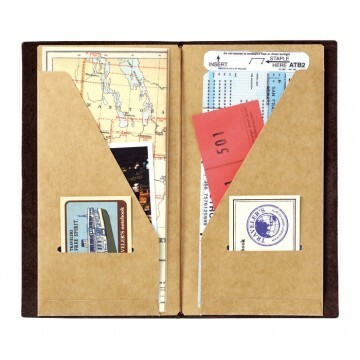 A Traveler's Notebook insert is 210 mm tall and 110 mm wide. Ours is going to be just slightly wider than that so it can sit flush behind another notebook. Get out a ruler and a pencil and start drawing all the lines you can see below. 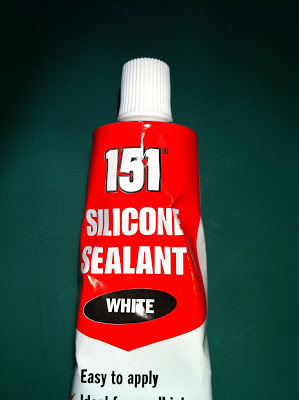 You can now glue and assemble. 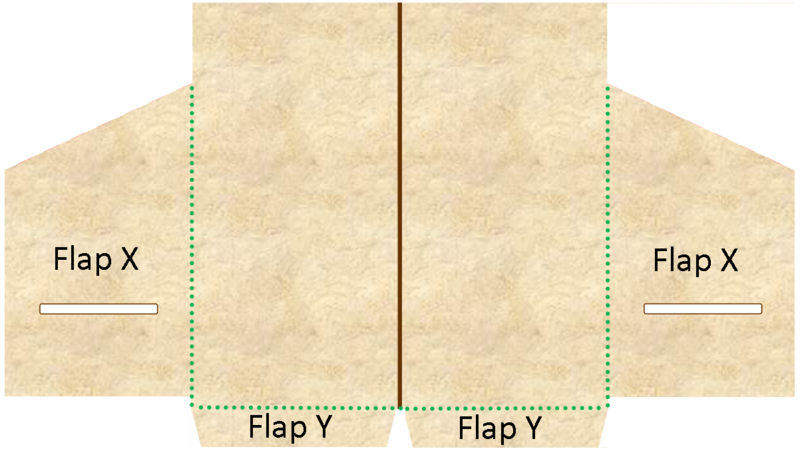 Fold over each Flap X, then glue each Flap Y and fold them up. 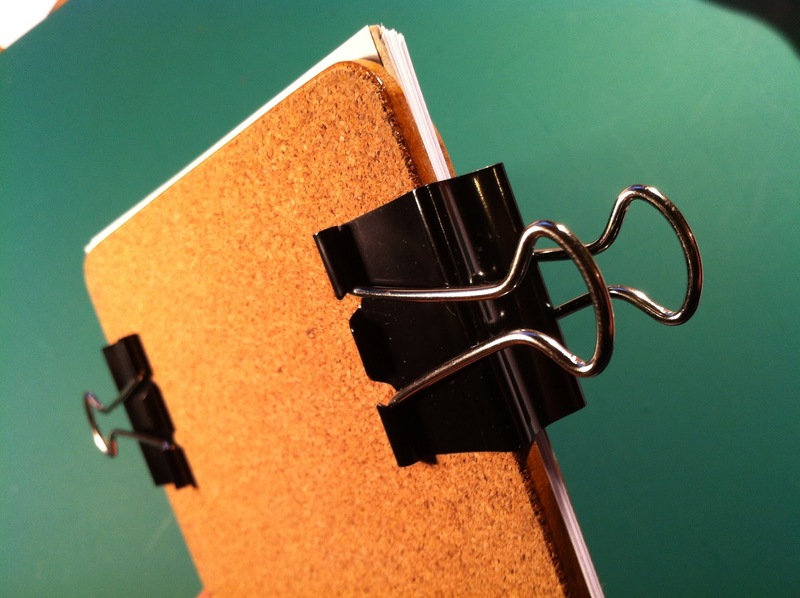 Hold them in place with binder clips while the glue dries. 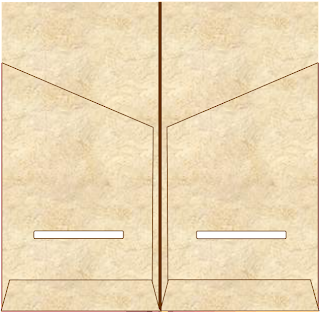 It is now ready to use. 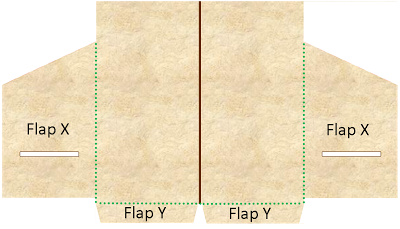 You can alter the shape of the flaps as you like. 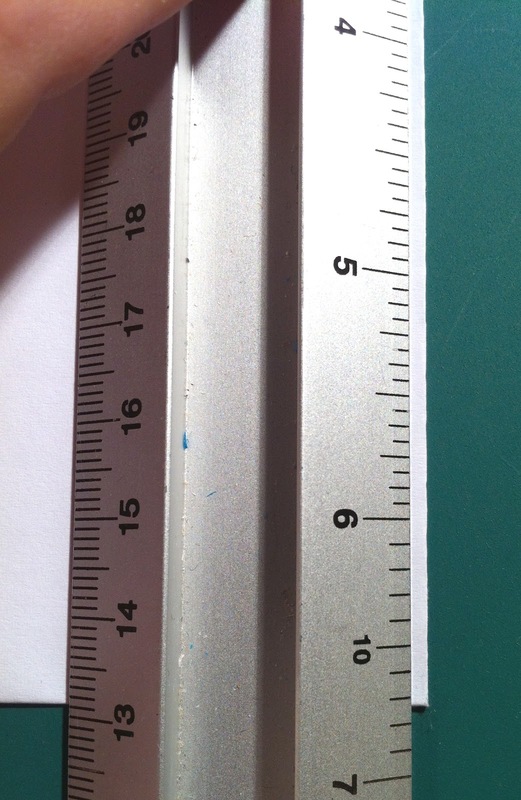 If you're holding two or more books in your Midori, you might want to make the 112mm measurement a little wider. 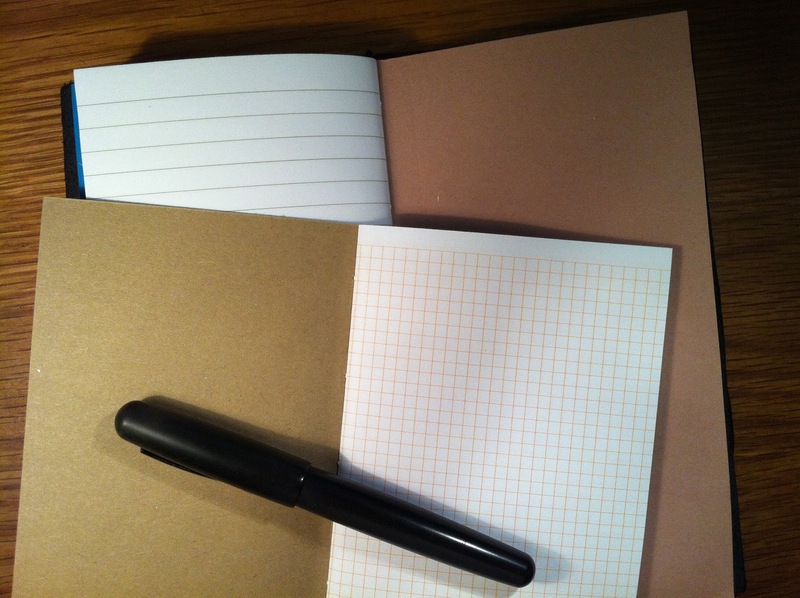 My recent purchase of a Midori Traveler's Notebook has made me consider my views on the Filofax, and ponder on the relative merits of the two systems. 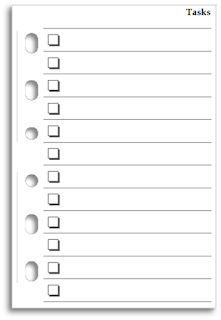 Let me say right now, if forced to choose between them, I would pick the Filofax, purely on instinct. 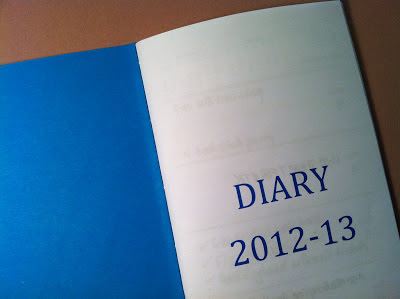 After all, Filofax has been my daily companion for a long time. It's true that there was a time when I turned away from it to explore the attractions of electronic organisation. But I came back when the novelty wore off and the limitations of the electronic platforms became tiresome. So why am I now turning to something new? Well, because the distant grass is always greener - while it remains distant. People whose opinions I trust were raving about the Midori. It was gaining a web presence. There were pictures, beautiful pictures. The grass looked very, very green. I had to see if it genuinely was that green; if I hadn't I'd have found no peace. I think this is a feeling that serial Filofax buyers know well. 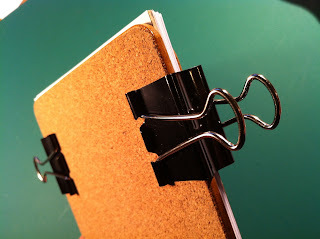 The new binder in the range probably won't be an improvement on your current favourite, but the thought that it might be gnaws away at you and denies you peace until you purchase it. In these, the early days of my Midori ownership, the honeymoon if you like, I am enjoying the novelty. The leather is plain and dignified, the workings deliciously low tech and it's hard to see how these could suffer any kind of manufacturing defect (I'm looking at you, Filofax rings.) 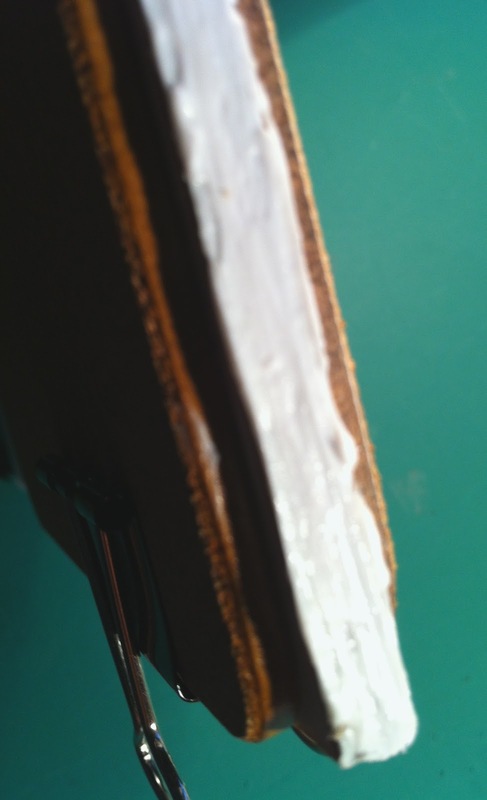 I particularly like how the binder's footprint is only very slightly bigger than that of one of its pages. 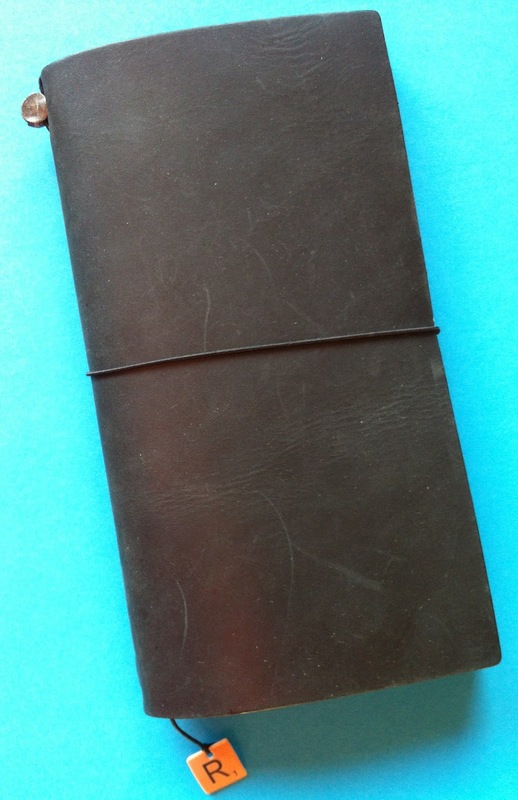 It has to be said that I quite like the commitment involved in writing in a bound notebook, too. 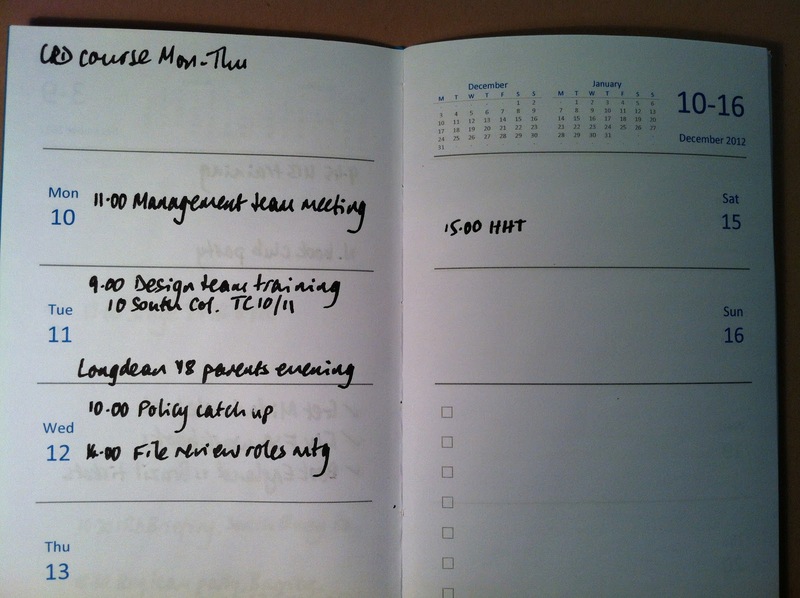 In the Filofax, when I can always toss a page, I don't feel so invested in making sure I write carefully. 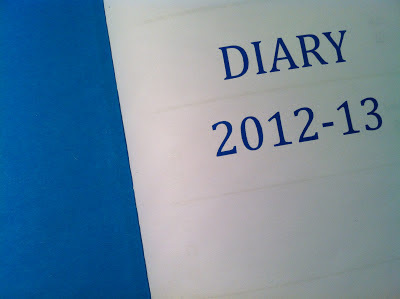 But, how could I ever walk away from the Filofax again? The elegance of the loose-leaf system remains compelling. 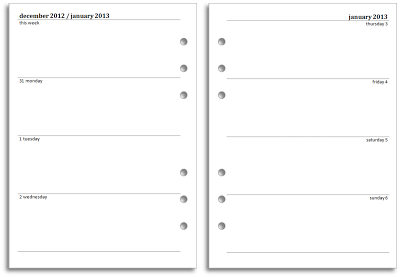 Pages can come and go and move from one binder to another whenever I like. 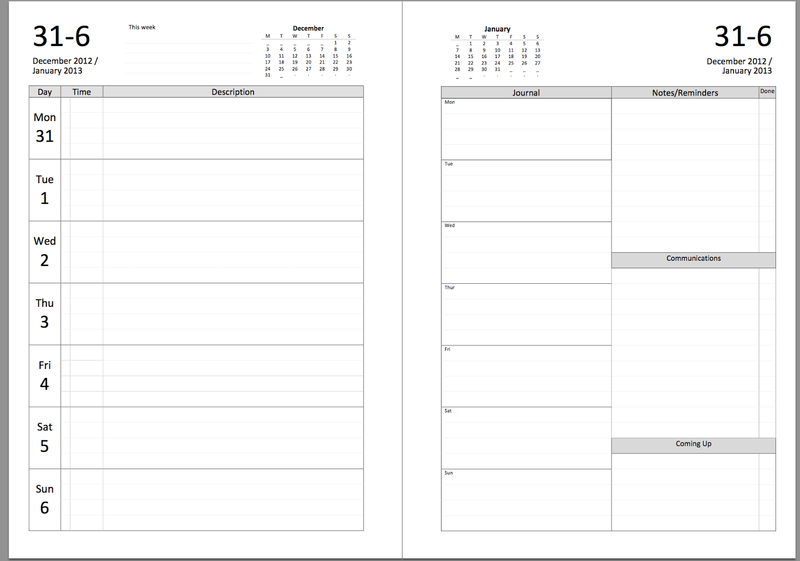 Custom content is far easier to create for any size of Filofax than for the Midori (although that hasn't stopped me trying.) 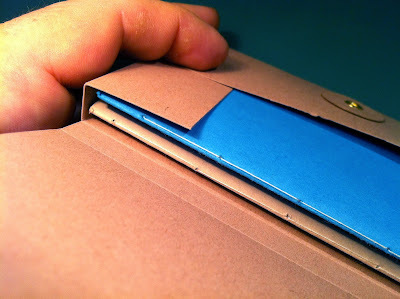 And the pockets - perhaps the best feature of modern Filofax binders - are way more functional and secure than any of the Midori approximations of a pocket. I have been trying all the way though this post to avoid the awful, sexist metaphor that would see the Filofax as my wife and the Midori as a mistress. Quite aside from the questionable taste of the comparison, it doesn't work in the end, for one simple reason. 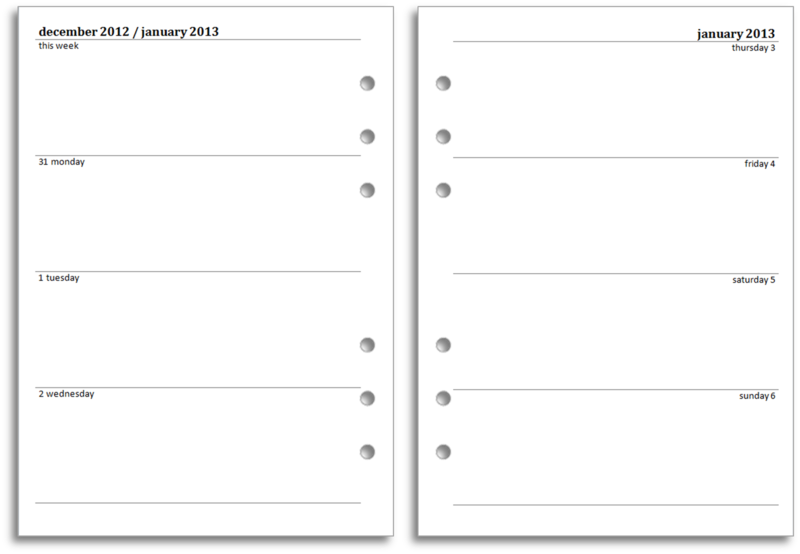 I will never have to choose between Filofax and Midori. I can live happily with both. I can work out in my own time which system is best for which things. I can put one down and pick up the other free from angst or guilt. I am happy to report that the grass is green all around me. But what's that right at the bottom? The Midori has a hanging bit of string for use as a bookmark and the intention is that you tie some sort of little charm to the end of it. This offends my functional aesthetic a little, but the bookmark won't work properly without something hanging from the end. I thought a nice touch might be a wooden scrabble tile with my initial on it. 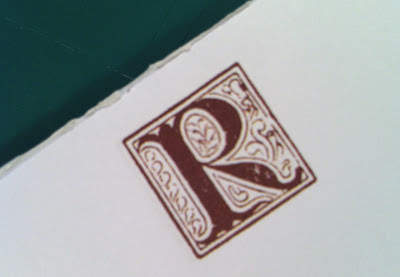 But I don't have a Scrabble set that has wooden tiles, and if I did I'd probably want to keep all the tiles rather than drill through one of them. So, I unearthed some special Avery printer paper I bought years ago called 'Plastic Fantastic', which is a modern implementation of shrinky dinks. I could probably make all sorts of charms in exactly the same way, but one will do for now.